Below is an explanation of what BPay is, and how you can integrate your BPay account with Storman. Step 1: What is BPay? Step 2: How do I get BPay? Step 3: How do I setup BPay? Step 4: How do I use BPay? Step 5: How do I get paid using BPay? BPAY is an electronic bill payment system in Australia only that enables payments to be made online, mobile or telephone banking to organisations that are registered as BPAY billers. BPay is available Australian Storman Ezidebit users only. How do I get BPay? To register for BPay you will need to contact Storman Support support@storman.com. One of the key questions is whether or not you want to use a generic BPAY biller code called "EZIDEBIT Storage" which is available to use straight away, or you can you can request your own for a one-off charge. Requesting a your own also takes about 4 weeks to process with the banks. How do I setup BPay? Once your BPay account has been setup with the bank, we will configure Bpay in your Storman software. We will need to know your Biller Code (this is a 6 digit number) and the Sub Biller Code (this is a 4 digit number). Our Support Team will configure this in Storman for you and create unique BPAY Reference numbers for all of your customers. 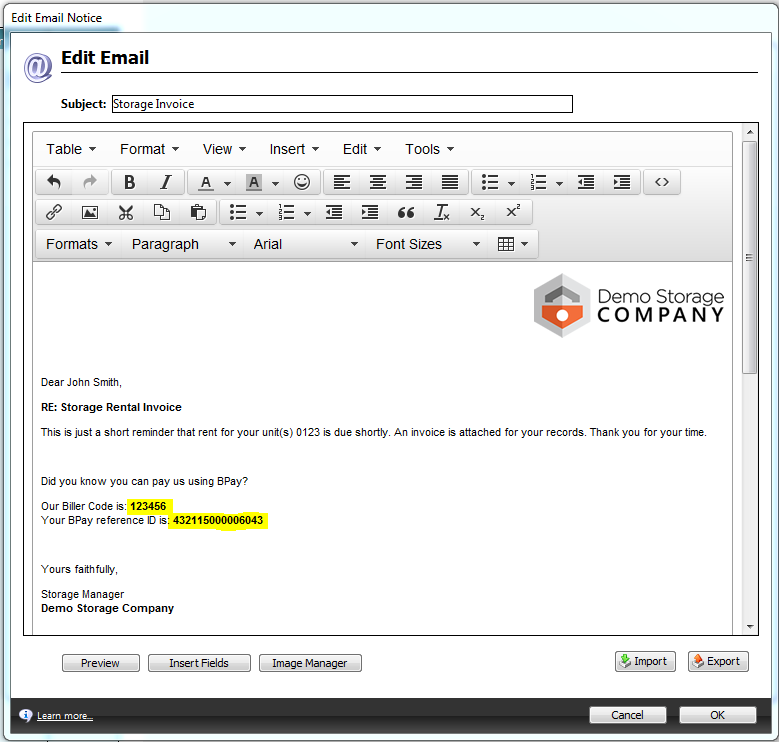 Below is a screenshot from Storman, showing the BPay reference number highlighted for a test customer. 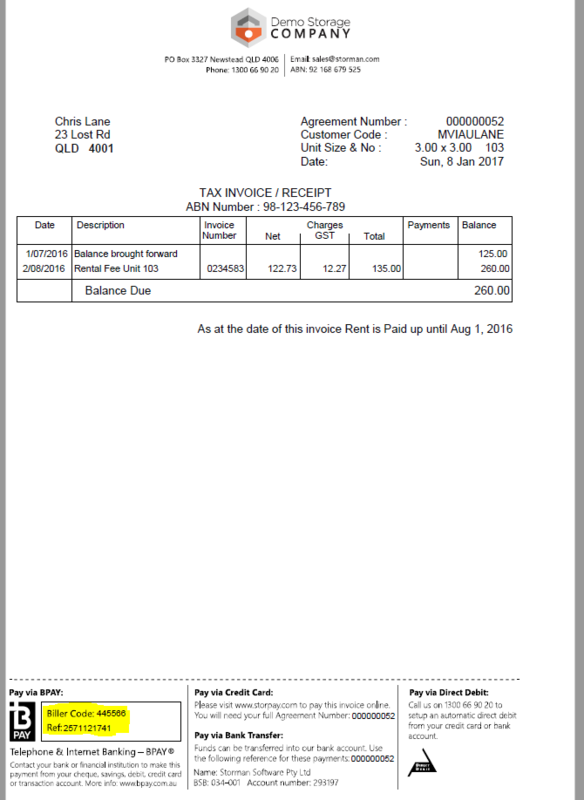 If you are not using a Custom Invoice Footer, you can use the new Storman 'Standard Footer BPay'. 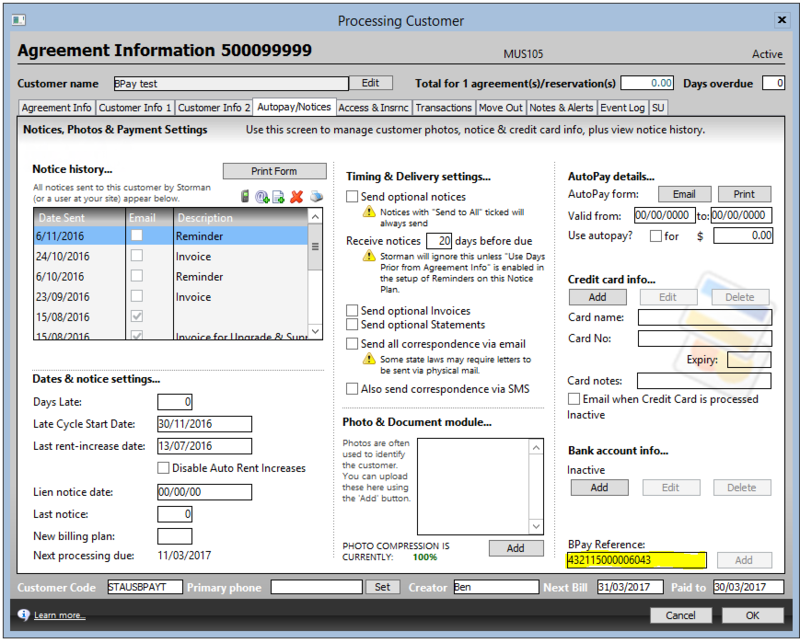 This can be selected from Maintenance > Invoice and Receipt Setup > Invoice Footer. How do I get paid using BPay? Your Storers will login to their bank and make a BPay payment using the Biller Code and Reference Number. At the start of your Daily Processing, Storman automatically will contact the Ezidebit BPay server and check for any new payments that have come through. If a payment has been made by one of your Storers, Storman will allocate that payment to the appropriate Storman Agreement and create a receipt transaction of the amount paid.